And yet another environment concept. I wanted to really play with the sense of scale to the environment. Very nice . The shadows are awesome and the grand scale is too cool. This image reminds me of the Fifth Element New York scene that they showed briefly in the movie. This is gorgeous. 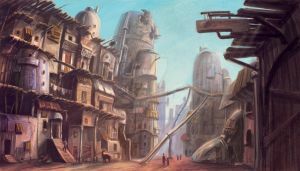 I used it as inspiration for my description of part of an alien city (with credit and a linkback) in my Mass Effect-related fanfic, here: [link]. Nice city, I like every element of it, I like the depth and lightning aswell. Looks like sunset on Coruscant. Very good concept art, I love !!!!!! Buddy, you hit this one out of the park--hell, you hit it out of the friggin' city and the state to boot!! Excellent work! Will have to fave this right away! "Do not stand behind him...if you value your life." Very reminiscent of Sparth. Nice work. Truly breathtaking. Awesome colours and so incredibly detailed. Great work! Suitably atmospheric and such fine detail.. THE BEST futuristic city I have ever seen! We gonna rock rock rock to the cities of...Oh...my bad, just saw Infected Mushroom this weekend. Very cool setting and atmosphere! This came out looking so realistic. I read in one of the other comments that you did some work on this cutting out and painting over photos that you put into this? That is such a neat idea, could you give me another example of where in the picture you did that, other than the waterfall? Amazing, amazing work. Great mix of some natural elements within future urban landscape and yet another artist I have to start watching. Wait, that is not a render? Very impressive! And yes, Coruscant comes to mind. Very nice, Ii like how you gave it the feel of space and volume. It looks almost like it's a real place. I really like the concept of this piece. I'm also impressed that you added a waterfall and river. Not many futuristic city pieces have any indication of nature left. You obviously played with the scale of AWESOME ! Fantastic, such a sense of expanse. that is an awsome picture. Really fantastic composition and the details in the city are amazing. I love the warm palette you've used too. How did you draw the waterfalls, by the way? That's a great and very detailed job! Wounderful looking place you have created!! Awesome image!! Great work! !